HairMax LaserComb is the only at-home FDA Cleared medical device to treat hair loss and promote hair growth in men and women. We are proud to introduce the NEW HairMax LaserComb Premium which now incorporates an updated, modern, and innovative design with a rechargeable lithium ion battery. The new HairMax LaserComb Professional 12 utilizes the same laser diode system as the original HairMax Premium. It has a user-friendly, sleeker look, and most importantly incorporates a cordless option that allows you to use the device anywhere. You can now simply store your HairMax in the charging station provided when not in use and the device will be ready to exert its positive effects at any time, anywhere. 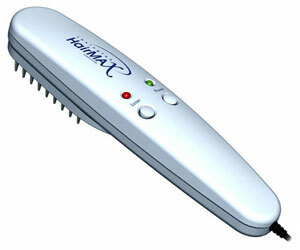 HairMax Laser Comb uses “cold-beam laser technology” for individuals suffering from hair loss. Clinically proven to promote hair growth, help improve the appearance of hair and reduce the appearance of thin hair. New product from DS Laboratories. Spectral DNC.N is the world’s first treatment with Nanoxidil. A true innovation, Nanoxidil™ dramatically increases hair density and promotes the overall health of the scalp. This is combined in a comprehensive formulation in Spectral DNC-N with multiple auxiliary agents implementing a unique multi-lateral therapy. The molecule responsible for the ion channel opening effect has a lower molecular weight than minoxidil and features several important advantages over the now outdated minoxidil compound. 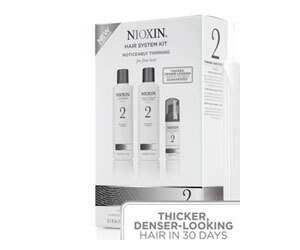 Nioxin Thinning Hair System 2. Designed for Fine, Natural, Noticeably Thinning Hair at the advanced stages of hair loss. BioAmp™ adds thickness and strength – With cystine amino acids and lightweight conditioning and treatment ingredients. Helps provide thicker-looking hair by increasing the fullness of each hair strand, reducing hair loss by strengthening against damage and breakage. Activ-Renewal™ gives a more youthful-looking scalp and fuller, healthier looking hair – With white tea extract, peppermint oil and cleansing agents. Provides a refreshed scalp environment and healthy shine to natural hair. Scalp Access™ Delivery System helps protect nutrients as they moisturize and energize the scalp and hair combined with SPF scalp protection against UV rays – With vitamins, botanicals, SPF 15 sunscreen, and purifying agents. Helps clean away follicle-clogging sebum and environmental residues from the scalp skin, while providing sun protection for the scalp.